Whitehawk today announced their squad numbers for the new season. Fernando Olivera was assigned the number 27, Amoroso got number 23 and Lucas Echegaray was handed the number 19 shirt, which was previously assigned to Miodrag Kostic. The Serbian World Cup winner was the only player to have seen a change in shirt numbers, as he was re-assigned to the number 7 shirt. Kostic follows in the footsteps of Ryan Gauld and Kevin Griffiths, the two previous owners of this iconic jersey. Miodrag grew up in Belgrade, Serbia. His love of football, combined with faith and fortune, saw him play for Partizan Belgrade's junior teams. 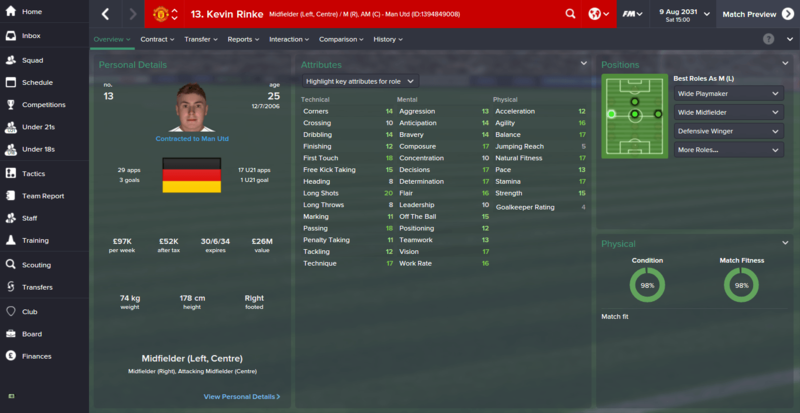 Youth coaches were impressed with his qualities and he was fast-tracked to the U19s, aged 15. 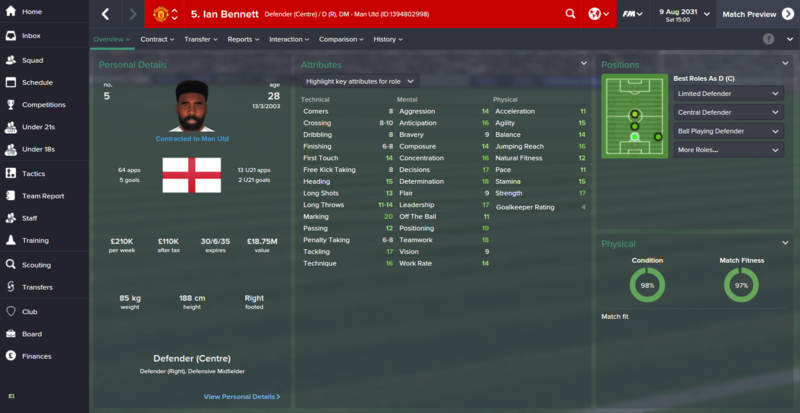 He played regularly at this level before sealing a move to Whitehawk in 2025, at the age of 18. A torn hamstring and a broken ankle plagued his first season at the club but he soon found form the following season, scoring 25 times in a campaign where he played 49 times (starting 27) as a left sided inside forward, or as a central striker. 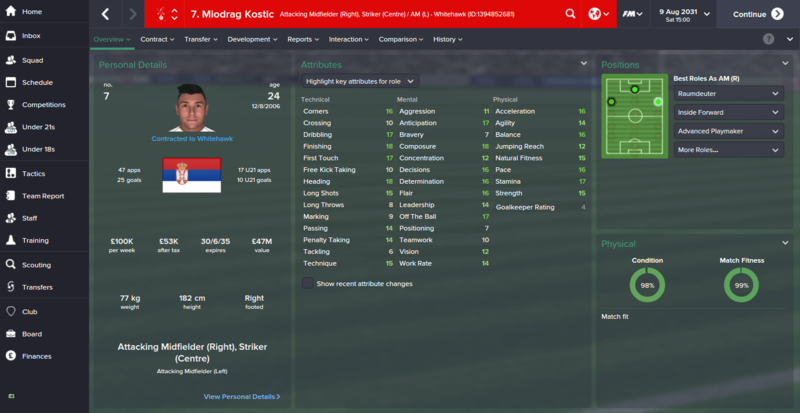 Miodrag continued to impress current coach Prince William and his eye for goal saw him quickly become a fan favourite. 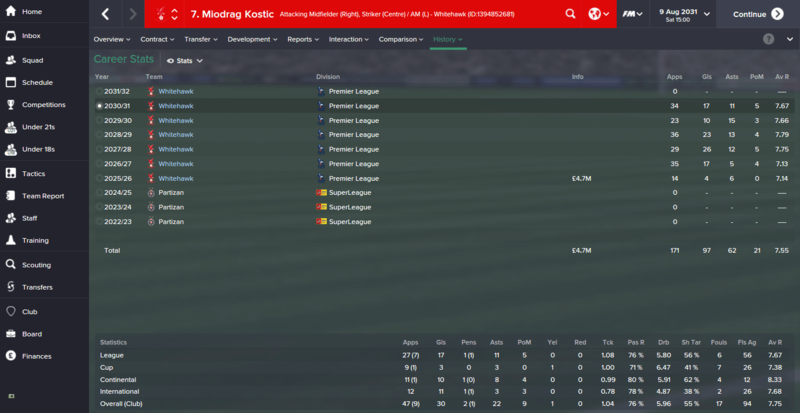 Kostic has been at the heart of the great Whitehawk side which has picked up so many trophies, including four back-to-back league titles and three back-to-back Champions League titles. His record at Whitehawk to date speaks for itself, he's a truly iconic figure at this football club. 246 appearances in all competitions for Whitehawk, scoring 140 goals. At the age of 24, Kostic is just getting started. Miodrag Kostic: "I love this club with all my heart. Ever since coming here just over six years ago, I have been at home and have loved the football I play. We are a very successful club with great players and staff and I love the fans. They create the best atmosphere in the league and so I am very happy to play for them. We are like a family and everything we do, we do it together. It is a great honour for me to wear this number seven shirt. It is has great significance to every football club to wear this number and I will treat it no differently. Last season I scored thirty goals, but I want to score more this time. We want to win everything once again and I want to do this jersey justice. The number seven deserves a fantastic player and I hope that the fans will accept my contribution to its legacy when I retire." Looks a great player, very deserving of #7! LFC, yeah and his history at the club is certainly a testament to that! This is the game of champions; you have to win to come here to play in this reputable competition. This is the curtain raiser of English football; the start of a new season. The two biggest sides of last season in England come here to open the account for this season. Many great tales are told of previous Community Shield fixtures. The two sides for this year's competition have met on this stage twice previously, with one apiece from the two contests. But who will claim this one? 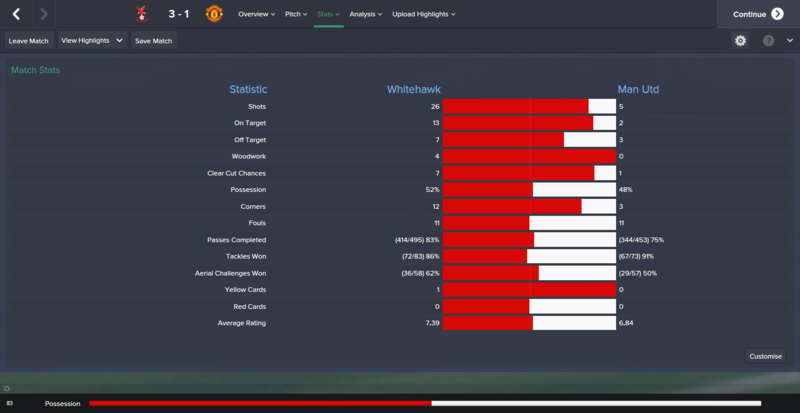 Whitehawk or Manchester United? Whitehawk are the undisputed champions of English football, European football, and world football. However, their opponents cannot be underestimated for one second. Manchester United were the only team in the world who came close to Whitehawk last season. Under Guardiola, the Red Devils finished second in the league (behind Whitehawk), reached both the FA Cup and Capital One Cup finals (where they lost to Whitehawk), and reached the semi-finals of the UEFA Champions League (losing to Whitehawk once more). The hopes of those wishing upon Whitehawk's downfall certainly rests on the shoulders of the Manchester United players and manager. But what can they threaten Whitehawk with? Manchester United have certainly not hit the heights they previously had under Sir Alex Ferguson. Louis van Gaal won the league twice, in 2014/2015 and 2016/2017, but the Dutchman retired following the second season. The club languished in the top four without winning the title until Andres Villas-Boas lead the side to two league titles in 2024/2025 and 2026/2027. However, AVB's departure, coupled with the emergence of Whitehawk under Prince William, have knocked them back off their perch. 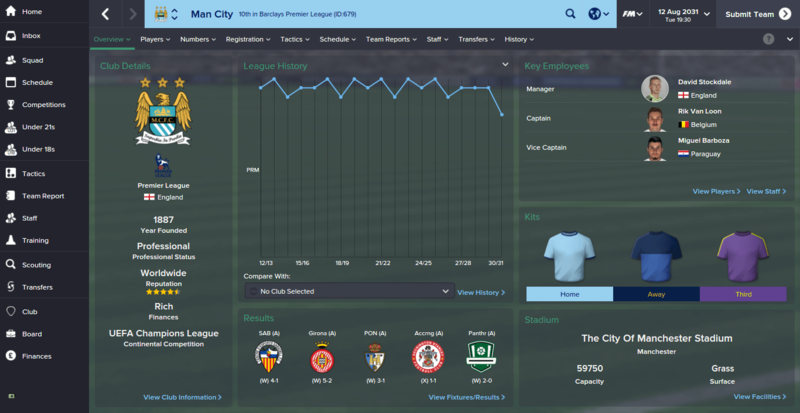 They now have to settle for fighting for second place each year with neighbours Manchester City, while Whitehawk seemingly storm away with the league each season. Manchester United have plenty of quality in their squad. Former Whitehawk star Natanael leads the line for Manchester United. The Brazilian scored an impressive 27 goals in all competitions last season for United, his first season back in English football since leaving Whitehawk for P Ferreira back in January 2028. Fellow Brazilian Gilmar has claimed plaudits for winning the Barclays Premier League Golden Glove last season, and was a key part of Brazil's Copa America winning squad in the summer, where he was of course managed by Prince William. Pacato completes the trio of Brazilian superstars at Man Utd, and the right-back has been heavily linked with a move to Whitehawk in recent weeks, with Prince William even publicly announcing his intentions to sign this player. Other key players include German midfielder Kevin Rinke and English central defender Ian Bennett, who captains the side. Will he lift the trophy at the end of ninety minutes, or will Whitehawk's supremacy continue? 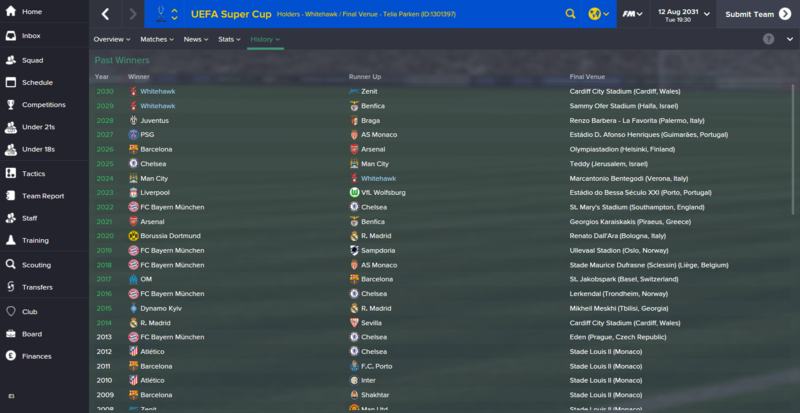 Whitehawk begin this season as they ended the last. 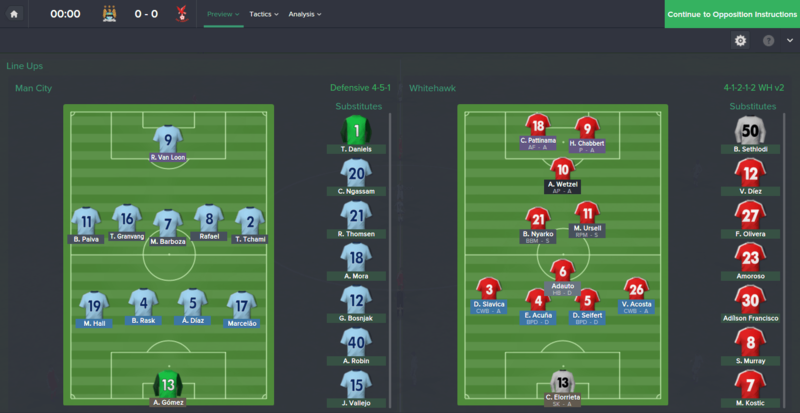 Just as they lined up at both the FA Cup and Champions League finals of last season, Whitehawk will begin in a 4-1-2-1-2 formation. Argentine Claudio Elorrieta tends the goals today, while Vicente Acosta, Emmanuel Acuna, Dennis Seifert and Dino Slavica start in defence. Adauto will protect the defence in deep midfield, with Matt Ursell and Bismark Nyarko ahead of him. Captain, and legend, Albert Wetzel lines up behind the deadly duo of Hippolyte Chabbert and Christiaan Pattinama. Josep Guardiola has opted for his favoured 4-1-4-1 formation. Pacato starts for Manchester United despite both clubs being in talks over the potential sale of this player. Former Whitehawk striker Natanael leads the line for Manchester United, while World Cup winner Pedro Belsué plays at right midfield. 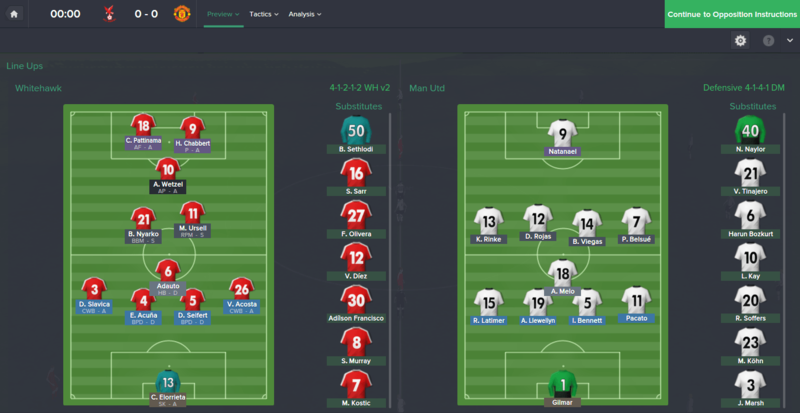 1' Kick-off: Manchester United open the English season with kick-off. 23' Save! From a throw-in on the right,Hippolyte Chabbert picked up the ball and weaved his way past Latimer before powering a left-footed effort at goal. Copa América winning goalkeeper Gilmar was forced in to a sharp diving save to deny Whitehawk the opening goal of the game. It is all Whitehawk right now! 29' Penalty! 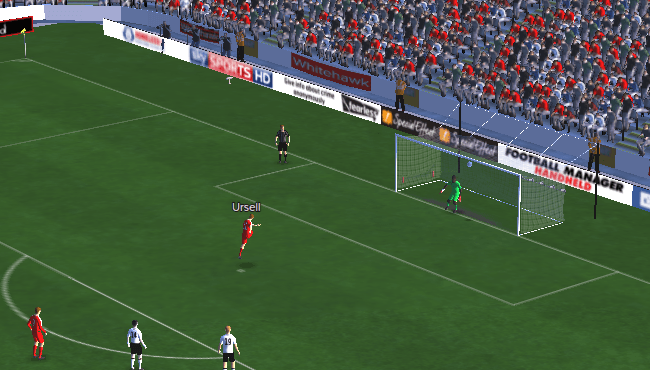 From a short corner routine, Matt Ursell picks out Christiaan Pattinama in the box. He prepares to fire a shot on goal but is brought down by Viegas. It is a stone-wall penalty and Whitehawk now have a clear chance to open the scoring. No booking. 30' Penalty Miss! Matt Ursell powers the penalty straight down the middle but it is just a fraction too high and it cannons back off the crossbar only to be cleared by Llewellyn of Manchester United. Another missed opportunity for Whitehawk in the opening thirty minutes, they should be two up! 31' Woodwork! 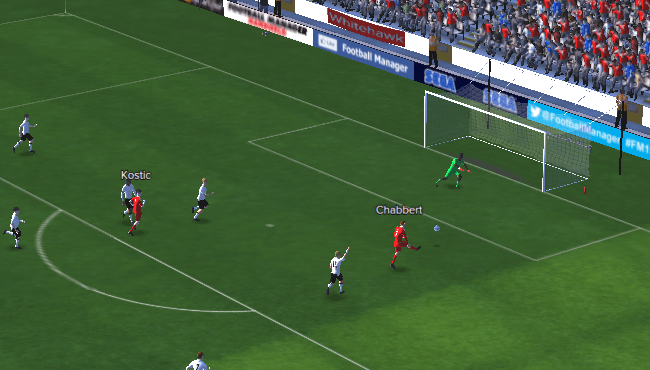 Whitehawk quickly counter attack and Wetzel rolls Chabbert in but the Frenchman can only hit the inside of the post, with the ball rolling across goal and away from danger. How have Whitehawk not scored yet?!? 45' Miss! 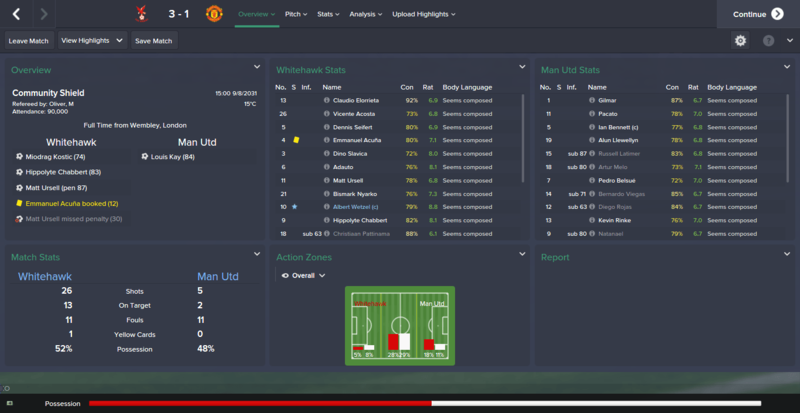 It is a rare chance for Manchester United as Natanael beat the offside trap to get on to the end of Rojas' long ball. He gets one-on-one but fluffs his shot and misses by a mile. Poor effort. 45+1' Save! Wetzel plays Chabbert in to a dangerous area, and he rolls in his strike partner Pattinama with a very neat through-ball. However, the Dutchman's rasping effort is palmed away by Gilmar. It looks like this half will end without a goal, but what great entertainment so far! 45+1' Half-Time: The first half ends scoreless but Gilmar has had plenty to worry about in the Manchester United goal. How much longer can they hold out for before Whitehawk break the deadlock? 46' Kick-Off Whitehawk start the second half looking to make amends for missed chances in the first half. 49' Save! 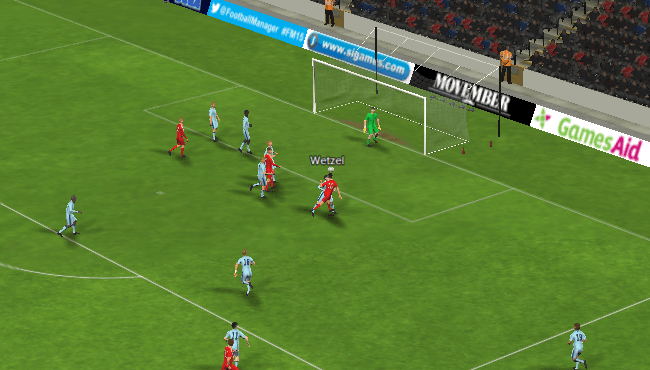 Wetzel has been very creative so far in this game and he has just created another golden chance for Pattinama! Wetzel received a pass from Nyarko before nutmegging Rojas in midfield and sending Pattinama one-on-one, with the latter having yet another shot tipped away by Gilmar. Whitehawk have continued on from the first half and don't look like easing up on their pressure. 67' Save! Wetzel's the creator once again! 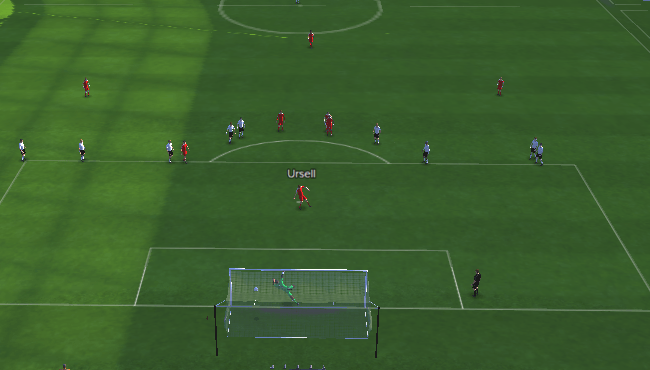 Hey plays the one-two with Ursell before finding Chabbert in the box, but Gilmar frantically dived to his left-hand side to deny Whitehawk a goal once more. This has probably been the best game in the keeper's career to date! 86' PENALTY! 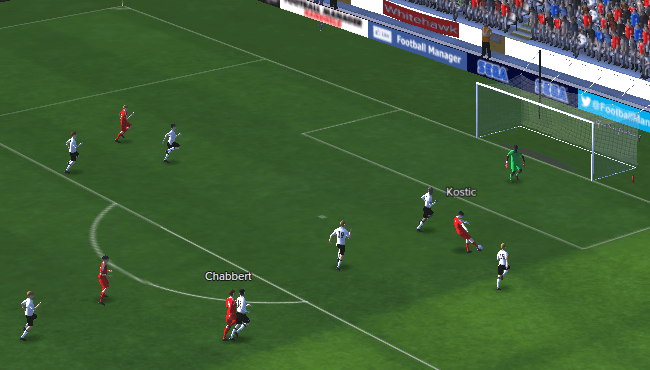 A sly reverse pass from Albert Wetzel had put Miodrag Kostic in acres of space to the left of the goal but before he could deliver a cut-back pass, he was brought down by Manchester United captain Ian Bennett, and now Whitehawk, once again, has the opportunity to score from the spot. Can they make amends for the previous miss? 90+3' Full-Time! And the referee calls time to yet another thrilling match between the two English giants. Whitehawk win once again, can they win every possible trophy for a third consecutive season? 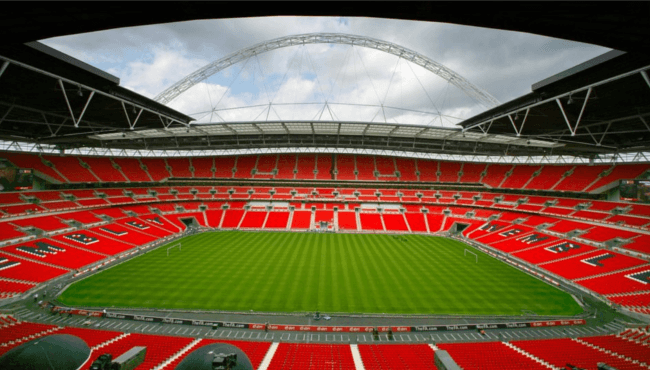 Just days after Whitehawk's Community Shield success, they are back in yet another final as they face UEFA Europa League winners Manchester City in the UEFA Super Cup final. 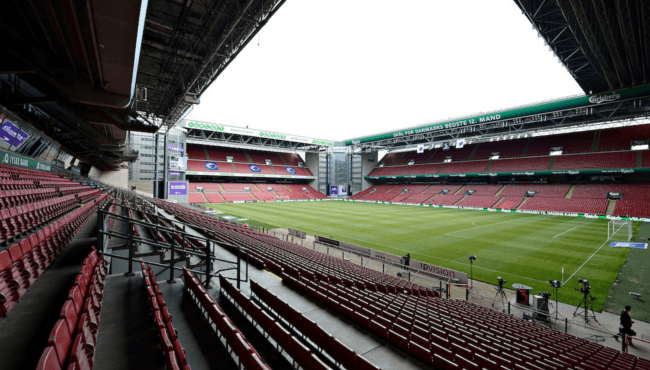 Having won it in each of the previous two seasons, Whitehawk are clear favourites for this tie and will look to make it a hat-trick of victories when the two sides face each other at Telia Parken in Copenhagen, Denmark. The Super Cup is a competition which AC Milan holds the proud record of most victories for, having won it five times. However, their most recent victory came no less than twenty-four years ago, when they defeated Sevilla in 2007. 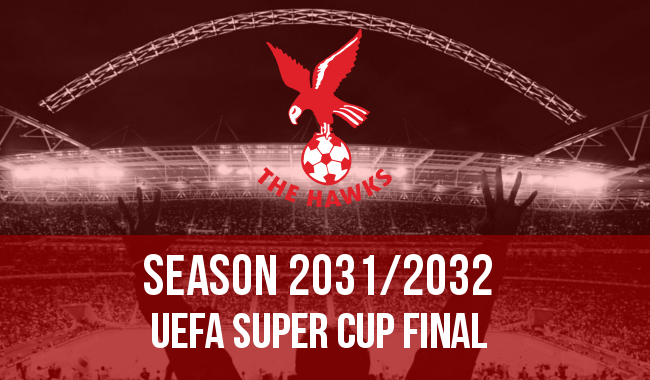 Manchester City have won it just once, and it is worth noting that Whitehawk were their opponents that time when they claimed the cup at Marcantanio Bentegodi in Italy, just seven years ago in 2024. Manchester City will be looking to repeat the feat and new manager David Stockdale will look to hit the ground running in his first competitive game in charge of the Citizens. The former Fulham and Brighton goalkeeper has never won a major trophy in his nine year managerial career, having won just three lesser league titles. 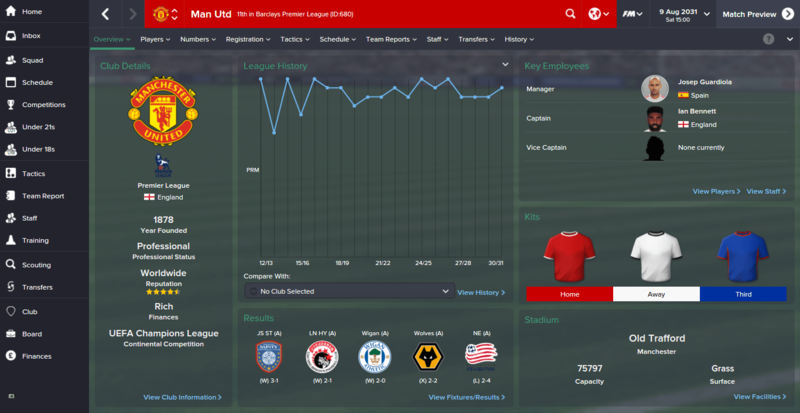 He won League One with Walsall in 2024, and the Championship twice. His first Championship title came during his spell as Blackburn manager in 2028, and the second when he was manager of Blackburn last season. This isn't his first venture in to management with a top team, having managed Chelsea from December 2028 to December 2029. It was an unsuccessful spell and he was eventually sacked. 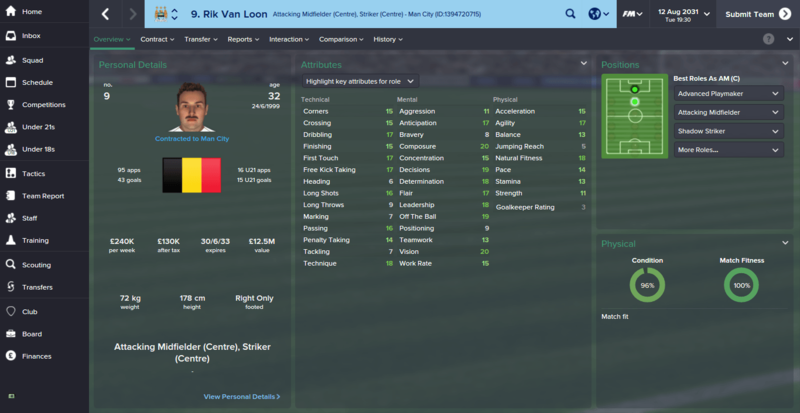 Manchester City's main threat is their captain Rik Van Loon. The thirty-two year old attacking midfielder/striker has won it all and is still one of the world's leading players, despite his age. He joined Manchester City from Barcelona in 2020 for a fee of £46.5M, and has been a star ever since. He has won 18 trophies with Manchester City, including the UEFA Champions League (2024) and three Premier League titles (2022, 2024 & 2026). He is the one man who Whitehawk should definitely target as a potential danger to their chances of winning this game. Van Loon is not alone, as Cameroon winger Thierry Tchami and Portuguese winger Bruno Miguel Paiva will be looking to produce the goods and score or create chances for the Citizens. Spanish midfielder Rafael is also a very dangerous creative player, and he knows how to shoot from range. Club legend Miguel Barboza is unlikely to start, the Paraguayan midfielder is now 32 and has slowed up quite a bit. Any part he will play is likely to be coming off the bench but his experience and intelligence would prove to be a vital asset. 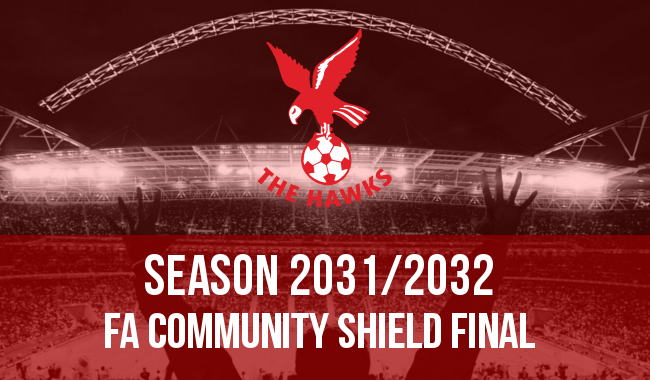 With all the quality that Manchester City has in their ranks, Whitehawk is still on a completely different level and it would be crazy to bet against the Hawks. They have more firepower and more defensive strength than any team in England, and Europe. Will they secure the result expected of them? Manchester City manager has opted for a conservative 4-5-1 formation today. Spanish #1 Abel Gómez tends the goals today. In front of him as a back four of Marcelao, Álvaro Díaz, Bjarne Rask and Mark Hall. Thierry Tchami starts on the right wing, with Bruno Miguel Paiva on the left wing. In midfield is a bit more of a surprise. Thirty-two year old Miguel Barboza unexpectedly starts, with former Whitehawk midfielder Thomas Granvang and Spanish international Rafael lining up beside him. Up front is Manchester City's captain and greatest ever player, Rik Van Loon. Whitehawk have an unchanged formation and line-up to that which demolished Manchester United just days ago in the FA Community Shield final. Clearly Prince William is not worried about Manchester City's chances in this game! 1' Kick-Off: Rik Van Loon gets the game underway for Manchester City. 26' Save! More fantastic flowing football from Whitehawk. Slavica finds space on the left-hand side and he picks out Chabbert with a great delivery. 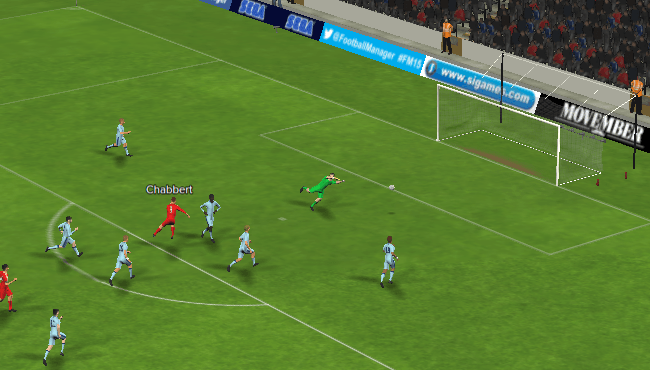 Chabbert strikes the ball on the volley but Abel Gómez was able to tip the ball on to the cross bar and out of play. 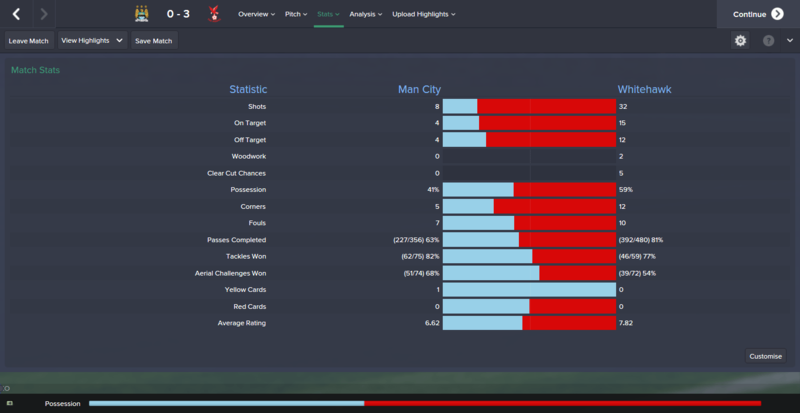 Close call for Manchester City, Whitehawk look dangerous! 45+2' Half-Time: The referee calls time on a dominant first-half performance from Whitehawk. 46' Kick-Off: Whitehawk get the game underway once more, having dominated the first half. 50' Save! First real chance of the match for Manchester City. Thierry Tchami gets in to an advanced position on the right hand side after leaving Slavica for dead. He cuts back for Rafael on the edge of the area who in turns slips the ball in to Rik Van Loon. The Belgian takes a touch before firing across goal but Elorrieta is equal to the tasks and parries the shot away. 89' Save! A missed chance for Chabbert to bag his hat-trick! Debut sub Amoroso picked up the ball on the half-way line before going on a thirty yard run, weaving in and out of City's midfielders. 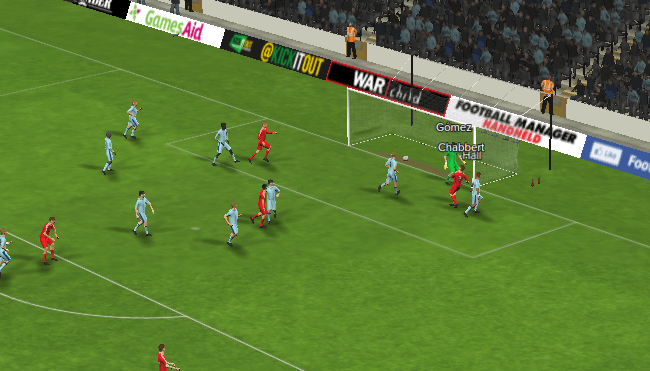 He then laid it off to Pattinama who picked out Chabbert in the box with just the goalkeeper to beat. 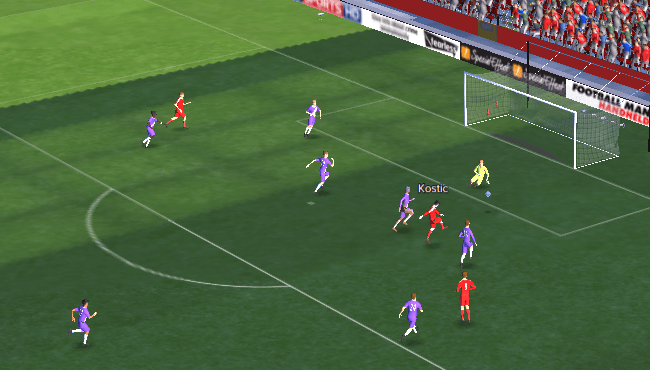 His left-foot effort was too close to the centre of the goal and Gomez palmed it away. Another great save in a difficult game for the Spaniard! 90+1' Full-Time: That's it, Whitehawk have won their second trophy in a matter of days! A promising season lies ahead of Prince William's army! 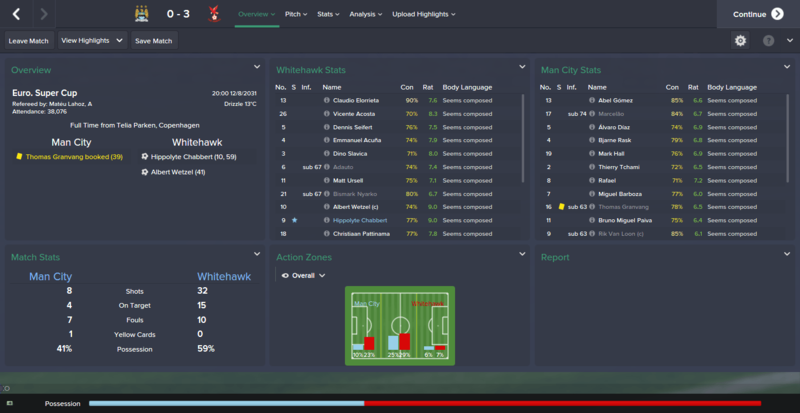 Man City 0 - 3 Whitehawk isn't something you hear everyday! Superb result. 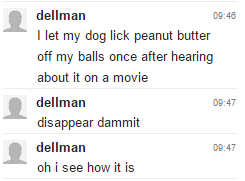 Just caught up with the story. Fancy WFC Winning TWO Trophies, and happy to see them dismantling the MANCHESTERS. I bet you will lose if it was Liverpool.Haha.